There are a variety of ready-made and custom installation techniques. Having knowledge of the different techniques allows you to choose among they which is most appropriate for any project. A cabinet installation can be a big job, but for all except the most involved projects, it’s nothing that any reasonably handy person needs to fear. There are just a few pitfalls and gotchas to watch for. With a little forethought and a few specialized tools and supplies, there’s no reason to expect anything but a smooth successful experience. Here’s a quick checklist of some of the most important considerations. “Planning” is without a doubt the single most important word in a cabinet installer’s vocabulary. For the best chance at success, you'll need to have an adequate plan for everything from plumbing rough-ins to under-cabinet lighting. In fact, before you start screwing the cabinets in place, it’s a good idea to know the installation space on an intimate level. Get out a tape measure, level and angle finder and spend some time mapping out the location of humps and sags in the floor and walls, the direction and degree of any slope in the floor or the tip in the walls and irregularities in the angles where walls meet. Whether you fantasize about a transformed kitchen or a more efficient laundry room, you'll like this reality check: Cabinet installation - a project that dramatically influences the functionality and style of a room - is not a daunting undertaking. It's a manageable job that offers significant cash savings and requires only a few basic tools, minimal skill and the help of a willing assistant. Ready-made cabinets are easier to install and less costly to buy than you may think. They're available to suit all styles, budgets and space needs, so you can create a entirely new look and gain more useful storage - without rearranging plumbing or rerouting wires. Measure the height of the base cabinets. Most standard cabinets are 34-1/2” high. Add 1-1/2” for a standard counter-top and 18 inches for a standard back splash, (though some designers now want a 20-inch back splash to make room for small appliances). With an 18-inch back splash, the total measurement should be 54 inches from the floor to the bottom of the upper cabinets. If your floor is not level, be sure to measure from the highest point along the wall. Draw a horizontal line across the wall at this 54-inch point which will serve as a guide for hanging the cabinets. Be sure to use a level to assure this line is true horizontal. Use a stud finder to locate the wall studs. 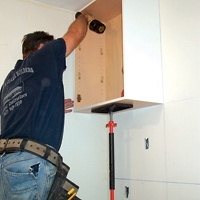 The wall studs are crucial to properly support the weight of the cabinets. Note: Pay careful attention to the position of all electrical wiring and plumbing. With the modular kitchen cabinets now available for purchase from many sources, "Do-It-Yourself" installation is easier than ever. This can be a big job, and to do it and get it right, you may want to get help from a friend. Take a bit of care to line things up correctly, and you can proceed with confidence. Always put the cabinet plan on the wall before starting as described in the Cabinet Layout Page. For information on cabinet quality visit The cabinet Quality Guide at the Kitchen Guide Book. I like to start with hanging the upper cabinets, so you're not tripping over, and beating up the base cabinets. Think about crown molding at this point and if it will need something to nail to, if so then attach a strip of wood along the top of the cabinet before you hang it. First install the corner cabinets. Use a cabinet stand or ledger to hold the cabinet up while attaching the cabinet. Measure and drill holes where the studs are located top and bottom of the cabinet and start cabinet installation screws in the holes. If there is under cabinet lighting then drill a hole for the wire under the cabinet. Once you finish a cabinet remodel you still need to install the new cabinet pulls. There are a few simple tricks to use to ensure the job goes quickly, smoothly and will look great. So here's a quick guide on how to install cabinet door pulls. The first thing you'll need to do is figure out just where you want to put up the new door pulls. Use a little bit of paste to tack the first cabinet pull up onto the cabinet door. You can adjust the pull up, down, left or right until it looks just right. Now go to the furthest cabinet and stick up another knob in the same general location. Adjust it until it's in line with the first handle you stuck into place. Nothing makes more of an impact on a kitchen than new cabinets. Similarly, no project will make you want to pull your hair out quite the way hanging cabinets will. What makes it so daunting is getting them to all line up perfectly straight—straight meaning level, square, and plumb. While you may have these principles straight in your head,invariably, your floor and walls will not. However, when they’re finally installed, visual satisfaction paired with an amazing sense of accomplishment will make you stand back, look at your kitchen, and say,“Wow, this looks amazing, and I did it myself!” background-color: transparent; text-align: left; text-decoration: none; border: medium none;"